Using the standard 'Display options' link in the create/edit entry or page screens in Movable Type 4 or Melody you can reorder and toggle the display of the various custom fields that you may or may not have added to entries or pages on your blog or installation. But once you save the ordering and visibility you like, it is only valid for the user account you are currently logged in with. 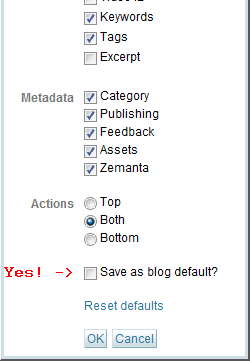 Changing the default order and visibility for all users on a blog used to involve either logging in as all of them one by one and changing the settings manually, or some pretty hairy database manipulation. But now there is a better way. Recently, Endevver released a plugin called Ordered CF that allows any system or blog administrator to check an additional box in the display options, making the settings the default ones for the blog. As I'm fond of saying here: nice!